Refashioned grille at leading edge of BMW’s new-generation 7-Series flagship. The facelifted 7-Series reflects the shift brought to upmarket BMW models by a new brand strategy announced by Chairman Harald Kruger in 2017, with a greater emphasis on interior luxury and a move to a more formal design language. The sixth-generation BMW 7-Series adopts a distinctive new front-end appearance as part of an extensive midlife facelift. The 3½-year-old luxury sedan once again will go head-to-head with the Audi A8 and Mercedes-Benz S-Class when North American sales begin during the second quarter. As with its predecessor, it will be produced in both standard-wheelbase and long-wheelbase versions. Both models are extended 0.9 in. (23 mm) taking their respective lengths to 201.6 ins. (5,121 mm) and 207.1 ins. (5,260 mm), while width and height remain unchanged at 74.9 ins. (1,902 mm) and 57.8 ins. (1,468 mm). The North American market only receives the long-wheelbase version. BMW designers have concentrated most of the stylistic changes to the ’19-model-year 7-Series up front. Key among them is the adoption of a large new chromed kidney-shaped grille similar in size to that seen on the recently unveiled X7. It extends back into the leading section of a newly contoured hood as well as deeper into a reprofiled front bumper featuring new chrome highlights within the lower air ducts to dominate the range-topping BMW sedan’s front-end look. The move to a larger grille, which sits within newly designed headlamps featuring adaptive LED main beams and optional Laserlight projectors, is among the exterior changes aimed at providing the new 7-Series with a more formal appearance than its predecessor. Imbued with 16 individual vertical chromed louvers, it is 40% bigger than the grille used previously. It also sits 2.0 ins. (5.1 cm) higher than before, giving BMW’s flagship sedan its boldest look since the first-generation 7-Series was launched in 1977. Accompanying the 7-Series’ front-end modifications are redesigned front fenders. They receive a larger chrome air-breather element that helps improve airflow and reduce buffeting within the front wheel wells at speed, BMW says. Also improving the refinement level is side glass that is 0.2 in. thicker than the outgoing model for greater suppression of wind noise. The visual changes continue at the rear, which receives more heavily structured OLED taillamps boasting new lens graphics. They are connected by a full-width LED light band that illuminates in combination with the daytime running lights. Also evident on the freshened 7-Series are wider chromed tailpipe trims integrated into a reworked bumper with a lower panel finished in an aluminum-look finish. Modifications to the interior of the 7-Series (below, left) are subtler than those brought to its exterior. 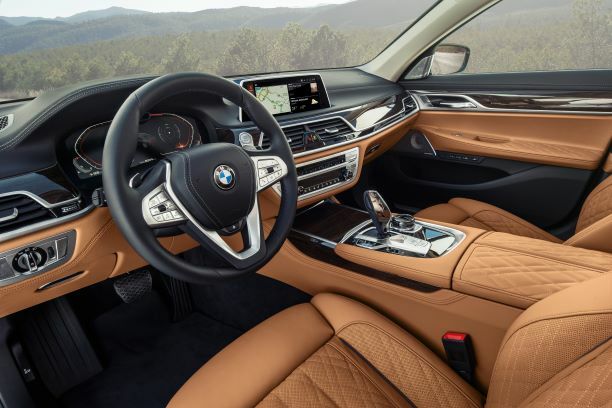 However, BMW says the adoption of higher-grade materials, including a new Nappa leather upholstery option as part of an Exclusive line, as well as new connectivity functions included in a seventh generation of the iDrive infotainment system, which now supports twin 10-in. (25.4-cm) screens in the rear, helps elevate its appeal. Part of a technical update for the new model includes a revised standard Parking Assistant function. It now features Reversing Assistant, which can reverse the new 7-Series for distances of up to 164 ft. (50 m) by steering it along the same course it took when moving forward. The ’19-model-year 7-Series offers a range of turbocharged gasoline and diesel engines as well as a plug-in gasoline-electric hybrid drivetrain in combination with either rear-wheel drive or all-wheel drive depending on the chosen model. The North American market will continue to take gasoline and hybrid drivetrains exclusively, though no details have been released on a successor to the existing price-leading 740i model. The confirmed gasoline units include a 4.4L V-8 producing 523 hp and 553 lb.-ft. (750 Nm) of torque in the 750i xDrive and 750Li xDrive. Above it is the M760Li xDrive powered by a BMW M fettled 6.6L V-12 developing 431 hp and a stout 626 lb.-ft. (849 Nm). This is enough to provide the 4,409-lb. (2,000-kg) 7-Series with a 0-62 mph (0-100 km/h) time of 4.1 seconds and 155 mph (250 km/h) top speed. Three diesel models all use the same 3.0L inline 6-cyl., but with differing turbocharging configurations and states of tune. With a single turbocharger, it develops 260 hp and 457 lb.-ft. (620 Nm) in the 730d and 730Ld, and in the all-wheel-drive 730d xDrive and 730Ld xDrive. With twin turbochargers, the output climbs to 316 hp and 501 lb.-ft. (679 Nm) in the 740d xDrive and 740Ld xDrive. The most powerful of the new 7-Series diesels is the 750d xDrive and its long-wheelbase sibling, the 750Ld xDrive. They use a quad-turbocharged version of BMW’s 6-cyl. engine developing 393 hp and 560 lb.-ft. (759 Nm). Also available is an updated plug-in hybrid drivetrain in the rear-wheel-drive 745e and 745Le and their all-wheel-drive sibling, the 745Le xDrive. It mates a turbocharged 3.0L gasoline I-6 with an electric motor housed within the forward section of the sedan’s standard 8-speed automatic gearbox. The two power sources’ combined output is 388 hp and 442 lb.-ft. (599 Nm) of torque, sufficient to endow the 745e with a claimed 0-62 mph time of 5.2 seconds and 155 mph top speed. With a 12.0-kWh lithium-ion battery, the 745e is claimed to boast an electric range of up to 36 miles (58 km) and combined cycle consumption of 112 mpg (2.1 L/100 km) on the latest European test cycle. The facelifted 7-Series comes as standard with a so-called adaptive suspension featuring electronically controlled dampers and air springs acting on each wheel. Rear-wheel steering for added agility is optional.